All too often, relationships between young people and their parents and grandparents become strained after experiences of migration. The Dulwich Centre Foundation is now involved in developing ways of working that provide opportunities for ‘inter-generational honouring’. As this is a crucial issue in many communities, we’re looking forward to seeing a range of local projects come out of this initiative – in Australia, Canada, and around the world. developing new methodologies for working across generations, including collective timelines and the ‘Kite of Life’. In 2010, Dulwich Centre Foundation colleagues at Oolagen Community Services and Turning Point Youth Services received funding to bring the ideas and practices of the Kite of Life intergenerational alliance to a new community, specifically the Tamil community in the neighbouring suburb of Scarborough. This new project will combine narrative therapy and art therapy ideas in order to find new ways to address intergenerational conflict. One of the unique aspects of this project is that community members who were involved in the St. James Town project will be trained in some narrative therapy ideas and will help facilitate the group. The idea is that the project will be able to become self-sustaining and similar groups can be run in the future. This project will use the Kite of Life methodology, as well as explore new ways of dealing with issues facing immigrant communities – using, art, music, video, photography, and dance. 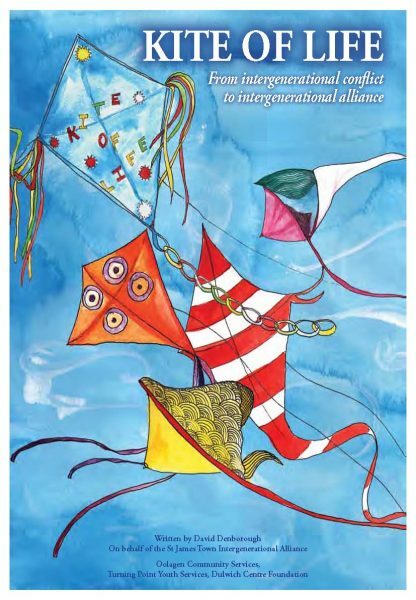 To read more about the Kite of Life methodology, see the recent publication Kite of Life: From intergenerational conflict to intergenerational alliance. For information about training in the Kite of Life, click here. While the Kite of Life was originally developed in collaboration with the Tamil community in Canada, Thilaka Xavier was determined that one day it would be shared with those in Sri Lanka. This has now occurred! What’s more, those working with vulnerable children in Sri Lanka are now using the Kite of Life in their work. The following publication describes this and also includes a moving exchange of letters between the Tamil community in Canada and Sri Lankan colleagues. Three versions of the publication are included here, one in English, one in Tamil and one in Sinhalese. This project was held in collaboration with LEADS. And the publication was funded by the Australian Government through the Direct Aid Program.